This is the third Sunday of Advent. We saw hope the first week when we read Genesis 3:15 where God promised to send someone who would overcome Satan. We saw hope last week as God revealed more of His plan to Abraham, Isaac, and Jacob. This week we will read passages about David being anointed king of Israel and about God's promise to raise up a ruler from David’s line whose kingdom will last forever. Israel had great hope because a righteous ruler was coming! We have hope because God always keeps His promises. Then all the tribes of Israel came to David at Hebron and said, “Behold, we are your bone and flesh. 2 In times past, when Saul was king over us, it was you who led out and brought in Israel. And the Lord said to you, ‘You shall be shepherd of my people Israel, and you shall be prince over Israel.’” 3 So all the elders of Israel came to the king at Hebron, and King David made a covenant with them at Hebron before the Lord, and they anointed David king over Israel. 4 David was thirty years old when he began to reign, and he reigned forty years. 5 At Hebron he reigned over Judah seven years and six months, and at Jerusalem he reigned over all Israel and Judah thirty-three years. 11 “’When your days are fulfilled to walk with your fathers, I will raise up your offspring after you, one of your own sons, and I will establish his kingdom.12 He shall build a house for me, and I will establish his throne forever. 13 I will be to him a father, and he shall be to me a son. I will not take my steadfast love from him, as I took it from him who was before you, 14 but I will confirm him in my house and in my kingdom forever, and his throne shall be established forever.’” 15 In accordance with all these words, and in accordance with all this vision, Nathan spoke to David. 14 “Behold, the days are coming, declares the Lord, when I will fulfill the promise I made to the house of Israel and the house of Judah. 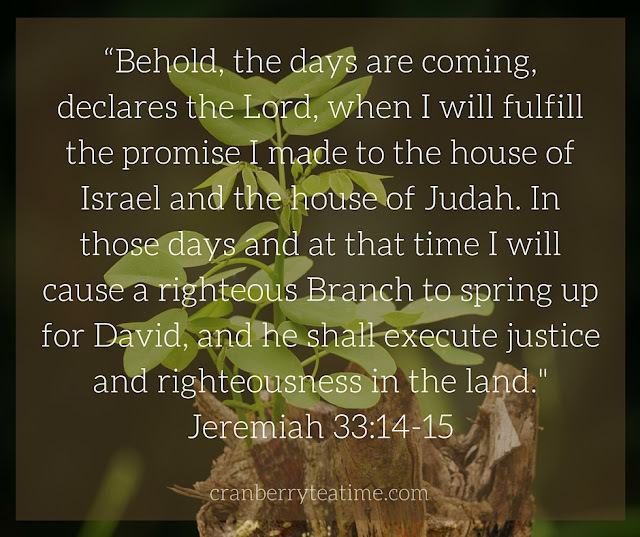 15 In those days and at that time I will cause a righteous Branch to spring up for David, and he shall execute justice and righteousness in the land. 16 In those days Judah will be saved, and Jerusalem will dwell securely. And this is the name by which it will be called: ‘The Lord is our righteousness.’"